The Celestron 44128 offers today's latest advances at an economical price, including upper and lower LED lighting that provides bright, natural colors, yet stays cool to the touch. Two included eyepieces (10x and 20x) and 3 objective lenses (4x, 10x and 40x) allow for magnifications of 40x, 80x, 100x, 200x, 400x and 800x. This microscope features an adjustable, stage with metal clips to center your specimen slides. The 10 included prepared slides guarantee exciting discoveries right out of the box. The simple condenser with rotating disc adjusts the lower illumination for enhanced viewing. All these features make the CM800 an excellent tool for labs, schools, field use and more. The CELESTRON LABS CM800 COMPOUND MICROSCOPE has many exciting features for users of all types. You can extend the lifetime of your CELESTRON LABS CM800 COMPOUND MICROSCOPE with the purchase of a FactoryOutletStore Factory Protection Plan. See the CELESTRON LABS CM800 COMPOUND MICROSCOPE gallery images above for more product views. 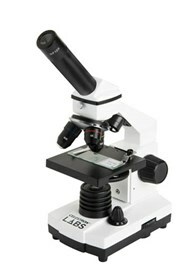 The CELESTRON LABS CM800 COMPOUND MICROSCOPE is sold as a Brand New Unopened Item.